Medical care transformed, 15 minutes at a time. Flip the Clinic is an open experiment to transform the patient-clinician experience where patients and health practitioners improve medical care together. An initiative seeded by Thomas Goetz and the Robert Wood Johnson Foundation, its goal is for anyone connected to health care (practitioners, patients, caregivers, creatives) to develop “flips”—simple ideas to improve the doctor-patient interaction in some way. FTC encourages people to pilot and test radical ideas that spur new thinking in health care. Volume (along with Reos Partners) worked with FTC’s creators from its very initial inception to build an extensive, people-centered program that enables participants to pilot, share and refine their innovative ideas for transforming their local clinics and communities. Over 80 flips have been developed since the initiative began, with hundreds of people participating in the seven regional labs and three-day national summit. The website allows users to easily create or comment on a Flip. Robust social media UX design allows for easy sharing. A short viral video was created to help explain the Flip the Clinic concept in a clear and engaging manner. From our initial brainstorms with Flip the Clinic stakeholders and expert consultants, we developed a FTC Test Kit that was sent to a select number of pilot clinics. The kit included wellness exercise prompts, farmer’s market prescriptions, a more holistic “vital signs” checklist, and waiting room ”Flip Cards” that help patients focus their questions and concerns for their practitioner appointment. These test sites then sent us feedback to further develop these tools. Over a one-year period, seven Lab workshops were held across the country to tap into health systems, clinics, organizations, corporations, and communities to ideate and pilot new ideas. The results of these workshops were published on the FTC website allowing people to comment on the ideas sprung from these sessions and then self-organize to further test them. 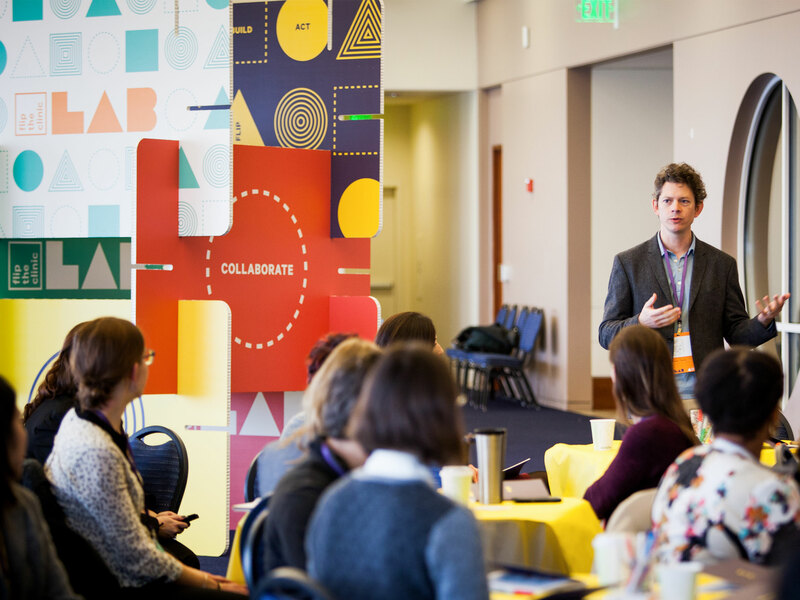 These workshops culminated in a national Flip the Clinic Summit, held in Denver, where participants from the labs came together to build on their earlier ideas to refine them for maximum utility and effect. Since this event in 2015, some flips have yielded robust online communities around the hashtags #IWishMyDoc, #IWishMyPatient, and #KidsIRB. Flip #55, “Increase Digital Health Record Engagement,” will soon reach 20 million patients and 160,000 clinicians. Whitney Bowman-Zatzkin, who launched this Flip, presented it at the White House Champions of Change for Precision Medicine event in July 2015. Keepsake high quality prints were given to all Summit attendees. Flip the Clinic is creating the possibility of a new system. It’s creating a critical moment next to the 20 minute office visit that can be incredibly powerful for the delivery of health care and health.